Tried Magenta on a few gems. Didn't work. Now every gem is blue. But Teclis isn't finished. I still need to properly finish the freehand on the cloak and robes and the base needs some more attention. 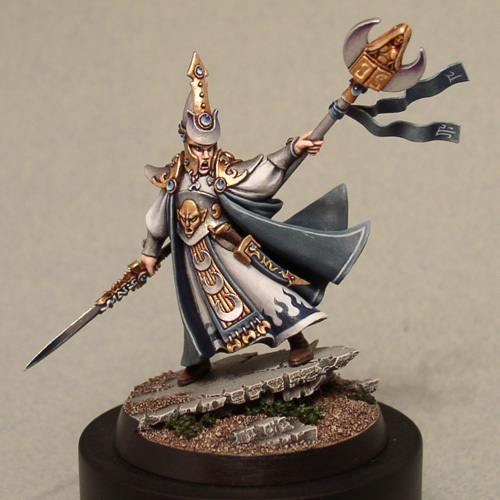 However, I feel the direction is right on track: More contrast, brighter metallics. Stronger image. The additional detail on the shoulders really worked out very well I think, and going back to my classic recipe for metal has also paid off. So far I am really pleased with the outcome, and I have a few ideas up my sleeve to make the final bits of freehand quite something. Well, Merry X-mas to all who have followed this project - I will try to get the last things painted over the next week or so.